Organizations need better network oversight. According to Information Week, recent data predicts “wasted” cloud spending on services and applications that aren’t fully utilized will reach $21 billion by 2021, while CIO points to Gartner research that suggests 30 to 40 percent of IT spending in large enterprises is actually funding shadow IT. The result? Tackling the twin challenges of cloud waste and shadow IT adoption demands better inventories of network assets and utilization, but this is just the beginning. 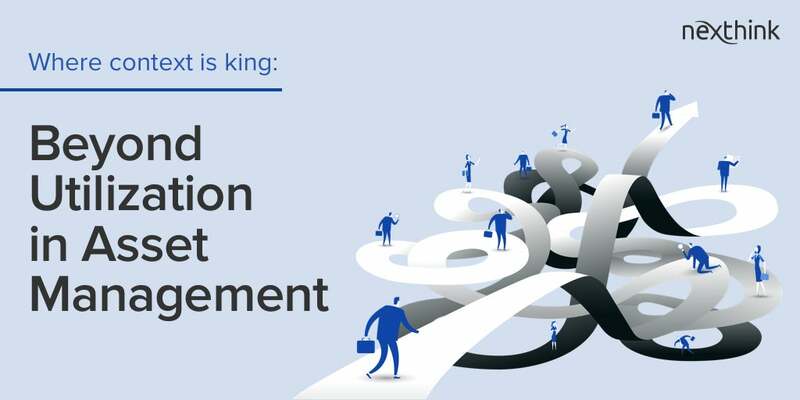 With end-user satisfaction now driving adoption and usage of IT services, context becomes king. How do companies go beyond basic asset management to deliver improved IT outcomes? Network visibility is critical for companies to manage sprawl and control shadow IT. Asset discovery tools have emerged to help organizations determine what applications and services are running on corporate systems and determine appropriate action. Two broad categories exist: Active discovery methods, which use network polling software to find devices and software, and passive methods which listen for broadcast traffic. These methods provide a high-level map of network services, giving companies enough visibility to spot obvious outliers but lacking the specificity to drive large-scale reform. Asset management vendors now recognize the need for improved visibility and have developed new solutions to help organizations gain more detailed insight by adding the capability to monitor asset usage. This provides the companion “how” of asset management to the “what” already offered by traditional discovery offerings, providing organizations quantitative measurements about asset usage. For example, these tools might discover that internally-developed IT services are being underutilized by employees across the organization, prompting the need for redevelopment. Or they may pinpoint SaaS subscriptions that were historically popular but have fallen into disuse as more comprehensive offerings took their place, allowing companies to cancel subscriptions or licenses to cut costs. These utilization tools improve the resolution of existing asset maps, making it possible to see the ebb and flow of service usage across corporate networks. Their limitation? Why. Employees don’t stop using tools and services for no reason — but even usage-based asset management tools lack the qualitative insight provided by granular end-user experience monitoring. Consider the case of SaaS subscriptions. While utilization tools show employee usage declining, they can’t account for why — what if staff need a different toolset to complete their work? What if they’re already using unapproved applications, or don’t have the proper training to use existing services? While cancelling subscriptions based on usage saves money up front, it could cost more over the long term as productivity slides and shadow IT adoption ramp up. Digital experience management tools frame usage in context, allowing companies to adapt network services and meet employee needs. Hardware is also a critical component of business success but is often overlooked by asset management tools. Headphones are a good example — with VoIP services like Skype topping one billion downloads from the Google Play Store, there’s a shift from desktop phones to in-office headsets bolstered by mobile technology. Utilization-based metrics might reveal that VoIP use is down across your organization, but contextual data driven by direct communication with staff could help identify emerging needs for high-quality wireless headphones that empower IP-connected calls. Asset discovery informs visibility — do expectations match reality for corporate network complexity and security? Adding utilization monitoring helps pinpoint problem areas, but only tells half the story. Here, context is king: When companies know why users adopt or reject applications, services and hardware they can design IT environments that empower staff to complete critical tasks, provide necessary app education, limit the impact of cloud service sprawl and mitigate shadow IT spending.